A star was born – for at least a day – Thursday night. It’s every end-of-the-bench scrub’s dream scenario, the fantasy that keeps them going through practice after dreary practice and endless games where they sit and watch: Come off the bench, hit the big shot, win the big game, take home the championship and exit the court amid chants of “MVP, MVP” from fans who never knew who you were until that night. Of course, it rarely comes true except in the movies. 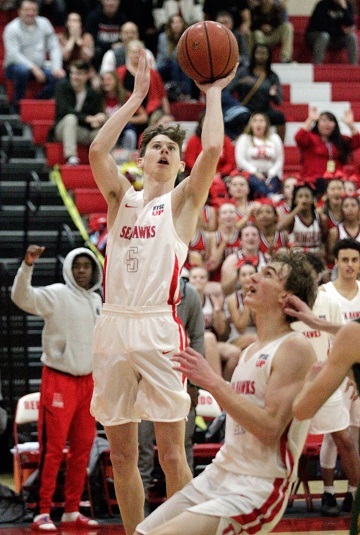 But Thursday night it actually happened for Liam Barrett of the Redondo boys basketball team as he led the Sea Hawks to a 60-46 victory over Mira Costa in the beach cities rivals’ annual backyard brawl. A senior guard, he had played all of two minutes in Redondo’s first 27 games. “I took a shot against Compton, but I missed,” he recalled. To make it even more unlikely, he had been in Redondo’s program for four years and didn’t even make the varsity until this year. “I played JV as a junior, because they said I would get more playing time than on varsity,” he said. Thursday night’s game started out as a potential upset. Mira Costa’s scrappy band of undersized over-achievers led by Lucas Hobbs, Hank Householter and Parker Lynch grabbed a 9-0 lead and held a 23-18 halftime lead. Mustang fans in Redondo’s packed Sea Hawk Pavilion were gleefully savoring what would be a monumental upset — and as a bonus would deny Redondo its seventh straight Bay League title. After six years of watching from the bottom as its next-door neighbor dominated the league, nothing would be sweeter or more satisfying. Redondo fought back in the third quarter and the Sea Hawks were clinging to a four-point lead when Barrett entered the game for what was supposed to be a two-minutes-and-done cameo appearance. Indeed, the first time he caught the ball he never hesitated. With defenders sagging off him he launched a high-arching three-pointer from the deep right corner in front of his team’s bench. It hit nothing but net and further ignited an already raging home crowd. Over the next ten minutes he drilled three more trifectas and threw in a 10-foot elbow jumper for good measure. By the time the damage was done, Barrett had rung up 14 points and Redondo had a 42-28 hammerlock grip on a game that had once been slipping away from them. At the final buzzer fans poured out of the stands and surrounded Barrett while chanting “MVP, MVP.” He drank it all in and was ready for his closeup when the TV cameras came calling. A game where the stakes for Redondo could not have been higher. After losing to Peninsula Tuesday night in a sloppy, poorly played home game that left Coach Parvez fuming, the two teams were tied atop the Bay League at 7-2 each while Palos Verdes was right behind at 6-3. To win the league outright and keep its streak going they needed to beat Costa and hope that PV beat Peninsula. Otherwise they would be co-champions with Peninsula. Sure enough, minutes after they finished celebrating Barrett’s unlikely role at the team’s savior, word came down that PV had beaten Peninsula by a single point, 53-52. The Sea Hawks six-year Bay League streak was still alive. Mike Solimando, who led the Sea Hawks with 15 points, said he was proud of Barrett for stepping forward when the team needed it most. But he said he wasn’t surprised. Lucas Hobbs led Mira Costa with 23 points, including five 3-pointers. Parker Lynch added 15 points for Mira Costa, the fourth-place team in the Bay League. Redondo, which finished 20-8 overall and 8-2 in league, got a first-round bye in the Division I playoffs and will travel to Harvard-Westlake for second round action on Tuesday, Feb. 12. Mira Costa, which finished 16-11 overall and 5-5 in league with wins over both Palos Verdes and Peninsula, shockingly was not chosen for a playoff spot in Division 3AA.